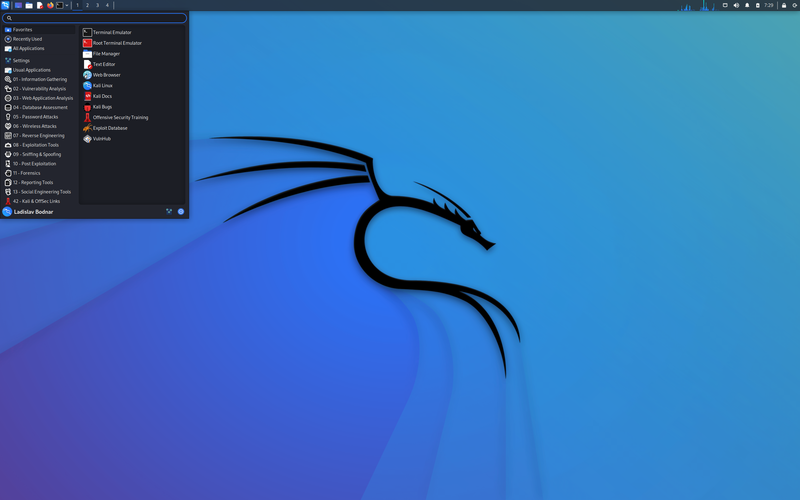 Rate this project Kali Linux is a Debian-based distribution with a collection of security and forensics tools. The project's latest release is Kali Linux 2018.4 which includes one significant new tool and an experimental 64-bit build for Raspberry Pi computers: "Welcome to our fourth and final release of 2018, Kali Linux 2018.4, which is available for immediate download. This release brings our kernel up to version 4.18.10, fixes numerous bugs, includes many updated packages, and a very experimental 64-bit Raspberry Pi 3 image. We have only added one new tool to the distribution in this release cycle but it’s a great one. Wireguard is a powerful and easy to configure VPN solution that eliminates many of the headaches one typically encounters setting up VPNs. Check out our Wireguard post for more details on this great addition. Kali Linux 2018.4 also includes updated packages for Burp Suite, Patator, Gobuster, Binwalk, Faraday, Fern-Wifi-Cracker, RSMangler, theHarvester, wpscan and more. We have also created a very experimental Raspberry Pi 3 image that supports 64-bit mode." Further information can be found in the project's release announcement. Download (SHA256, pkglist): kali-linux-2018.4-amd64.iso (2,994MB, torrent), kali-linux-light-2018.4-amd64.iso (867MB, torrent).